Young, lonely, yet kind Kosuke is a salaryman working in sales, but has no luck in love, despite a boss witnessing his coworkers and their various love relationships. One day a new sales job from another company comes along, and through that job he is reunited with a friend from ten years before—Mao, a beautiful free spirit who secretly is in love with Kosuke, but who lost track of him when they graduated high school. Kosuke is secretly delighted to see Mao again, and after the two of them get over a brief awkward stage, they reveal their mutual affection, which leads to a heartwarming romance and, eventually, marriage. However, Mao harbors a mysterious past. She was found wandering the streets naked as a child and adopted by a caring older couple, but she suffers from amnesia, and where she came from is still a mystery, and only a wizened old woman seems to know her secrets. That strange past and the secrets that still nag at her will eventually come back to haunt their seemingly storybook romance. Toho submitted the film to the US copyright office on November 4th, 2014 with the registration number of PA0001879403. 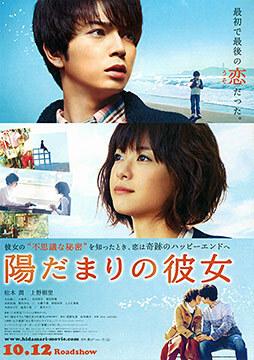 The movie was submitted under its Romaji title, Hidamari no Kanojo, and its international title, Girl in the Sunny Place. Authorship on the application was listed as Asmik Ace, Toho, J Storm and Amuse Inc.